A Casa Med SE Low Profiling adjustable bed is a simple, highly effective option for those who need a reasonably priced electric bed with a low position for maximum safety. With four different mattress supports that can be positioned to offer the greatest comfort or to help with circulation problems or pressure sore prevention. It has wide range of positions and very easy adjustment. Casa electric beds are a tried-and-tested option. This manufacturer knows exactly how to make an electric bed comfortable, functional, and usable for an elderly and disabled person and their carers, without sacrificing the look of an attractive wooden bed. Beech effect head and foot boards to blend in with your home. 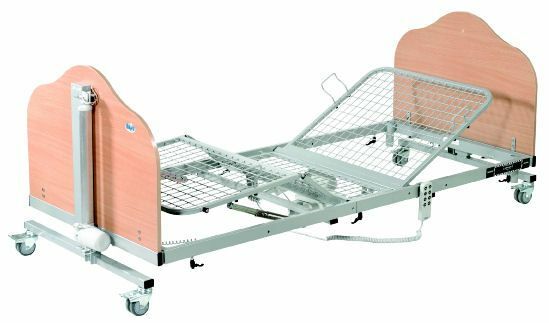 Twin axle four brake low gravity castors to make the bed very easy to manoeuvre. Removable mattress retainers at head and foot sections to keep mattress in place.